The rigid, high-grade aluminium profile section provides a perfect core to the mobile dividing rails of the YewdaleMovatrack 101 mobile curtain divider track system. This unique system is supplied as standard in white powder-coated finish and utilises maintenance-free, wheeled roller hooks for jam-free use. White suspension hangers fitted equidistant along track length for suspended track solutions or directly mounted to the ceiling as required. Moveable divider tracks within the outer frame as required. 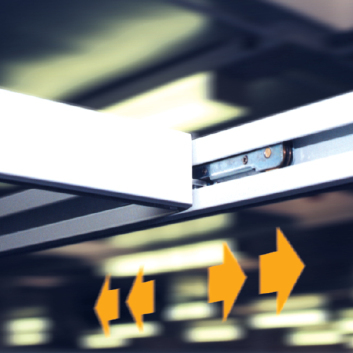 Designed to give years of trouble-free service, this curtain divider track system uses die-cast aluminium wall shoes for a secure locating where tracks meet the wall, unless directly ceiling fixed. Supplied with a curtain removal point as standard. The mobile dividing rails of the YewdaleMovatrack® 101 mobile curtain divider track system are a unique feature that revolutionises space utilisation in hospital wards. 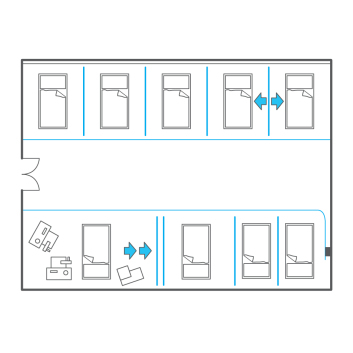 Cubicle widths can be altered in seconds by nursing staff in response to changes in medical requirements such as patient care or amount of equipment needed. If a spare dividing rail is provided, an extra bed-space can be brought quickly into use if required - with patient privacy upheld and maintained. The system comprises of a track, with curtains, across the front of a row of bed cubicles, and a back track, without curtains, fixed to the wall behind the beds. Mobile trolleys run within special slots in these tracks, and carry the mobile dividing rails, with curtains, smoothly and quietly on neoprene-tyred wheels. YewdaleMovatrack® 101 includes all the advantages of YewdaleMovatrack® 100 cubicle track and is fully compatible with it. The strong aluminium sections have a white powder-coated finish as standard. Any RAL colour available to order; Cubicle numbering system; Stainless steel roller hooks or rings. The YewdaleMovatrack® 101 mobile curtain divider track system as manufactured by Yewdale, +44 (0)1268 570900. 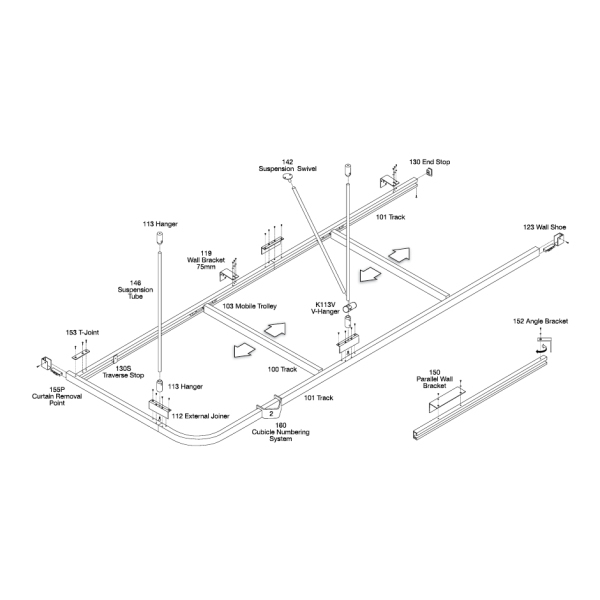 Track manufactured from premium quality aluminium with silver anodised / white powder-coated finish, able to span 2.0 metres without support, and including all necessary fittings. Mobile dividing rails fitted with wheeled trolleys running within front and back tracks. Double hangers to ensure full functionality of system. Complete with roller runner hooks at 10 per metre, curtain removal points per section and, overlaps as necessary, spaced in accordance with manufacturers recommendations. Flame retardant curtains from the YewdaleHarrier® range. Layout as shown on accompanying drawings. Fitting to be carried out by trained and accredited personnel.